FCIAC quarterfinal girls volleyball action between the Greenwich Cardinals and the Darien Blue Wave played on Tuesday October 30, 2018, at Greenwich High School in Greenwich, Connecticut. 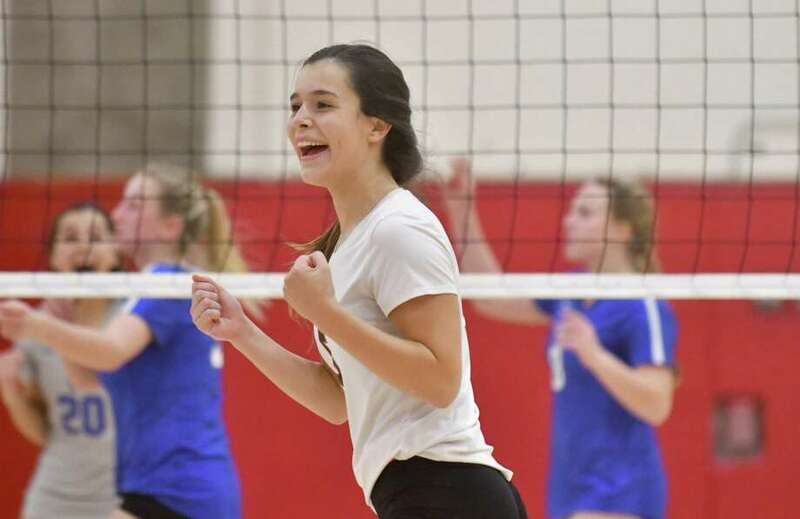 GREENWICH — Darien’s hopes of advancing in the FCIAC volleyball tournament the past two seasons were dashed by Greenwich, which stood between the Blue Wave and a spot in the conference semifinals once again, on Tuesday. Yet this time, the Blue Wave overcame their obstacle. Continuing to show steady improvement, fifth-seeded Darien returned the favor to Greenwich, eliminating the defending FCIAC champion Cardinals with an impressive 3-0 win in the conference tournament quarterfinals. Visiting Darien, which registered a 25-23, 25-17, 26-24 triumph over fourth-seeded Greenwich advanced to the FCIAC Tournament semifinals for the first time since 2015. Besides losing to the Cardinals in the postseason the past two seasons, the Blue Wave were edged by Greenwich, 3-2, on Sept. 21. Since that tough defeat, Darien has posted a record of 12-3 and has a 14-6 mark overall. Lindsey Bennett, also a senior captain, registered nine kills, two service points and one ace, while junior Elaina Cummiskey had eight service points, seven kills and four aces for the victors. Escajadillo tallied 29 assists, 10 digs and four aces in the winning effort. For Greenwich (13-6), freshman Adele Sotgiu had 10 kills and nine service points and senior setter Amelia Bartlett recorded 23 assists. Behind strong serving and a pair of kills from Sotgiu, Greenwich jumped out to a 7-0 lead in the first set. Two kills by sophomore Lilly Saleeby put the Cards ahead, 11-5 later in the set. Darien used solid serving, excellent hitting and effective defensive play to work its way into the game. Junior Hassana Arbubakrr, who totaled eight kills and three blocks, put down a kill at the net, bring the Blue Wave to within 16-14. An ace by Escajadillo later in the game, gave Darien its first lead at 20-19. With the Blue Wave leading, 24-23, junior Elaina Cummiskey closed out the set with a kill. Escajadillo notched 29 assists, 10 digs, four service points and one ace for the visitors. “We have improved a lot over the season, we have had our ups-and-downs, but we really began working together and that made the difference,” Escajadillo said. Darien led the majority of the second game, with Arbubakrr, Escajadillo and Aerin Bowman helping pace the squad. Bowman had eight kills and three blocks, junior Rachel Herget tallied nine service points and three aces and Sophia Talwalkar (junior) added seven service points in the win. Greenwich received nine digs and six service points from senior captain Carolina Lew, three kills from senior Erin O’Keefe and three service points and two aces from Alina Fingold. Saleeby and Sotgiu helped bring the Cards back in the third game, but Bennett ended the match with a kill. “We have a game on Monday and this is going to motivate us to work harder and harder for our state tournament game on Monday,” Bartlett said.